Step 1 Peel the silverskin from the spareribs, then rinse, pat dry and place in a large, nonreactive baking dish. In a small bowl, combine 1 1/2 tablespoons salt, the pepper and 1 1/2 tablespoons mesquite flour. Massage the rub into the ribs along with the olive oil. Cover with plastic wrap and refrigerate for 2 to 4 hours. Step 2 Heat the oven to 250 degrees. Place the onions on the bottom of a large roasting pan and place the ribs on top of the onions. Step 3In a food processor or blender, blend the juice, zest, oregano, habanero, ginger, brown sugar, dark rum, coconut milk, mustard and the remaining one-half tablespoon salt and one-fourth cup mesquite flour. Pour the marinade over the ribs, and cover the roasting pan with heavy foil. Step 4Place the ribs in the oven and cook for 2 1/2 to 3 hours, until the meat is tender and curled away from the ends of the ribs (you should see about one-half inch of bone at the end of each rib). If finishing them on the grill, save the drippings for basting. The ribs can be prepared to this point and refrigerated for up to a day (warm them in the same pan, covered, for about 20 minutes at 200 degrees before finishing). Step 5To finish the ribs in the oven: Remove the cover from the pan and cook the ribs an additional 20 to 30 minutes (at 250 degrees), so the ribs form a "crust" on top. Serve immediately. Step 6To finish the ribs on the grill: Heat a grill over medium heat. Oil the grill, then grill the ribs for 10 to 15 minutes, turning every 5 minutes and basting with the pan drippings, to caramelize the outer skin and get a good "crust." Reduce the heat if the ribs start to burn. Serve immediately. In Recipes-list.com we have selected the most viewed recipes from category - Main courses . Enjoy the best recipes specially selected for you! 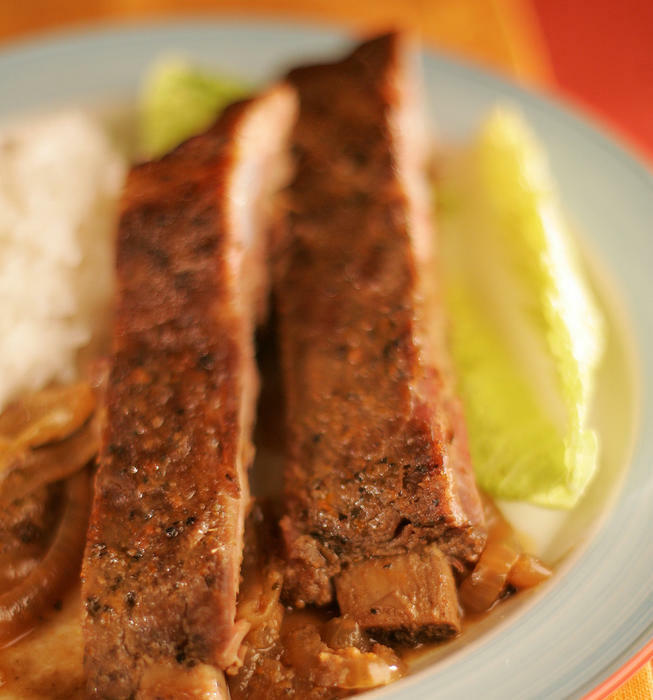 Citrus mesquite spareribs is the right choice that will satisfy all your claims.